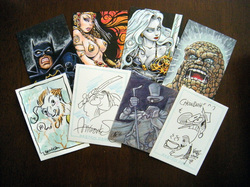 Sketch Cards by George Webber and other artist. Most anyone that follows George Webber (NoCashComics) at all knows he's won awards for his sketch cards and is also a pretty big fan of Copic Art Markers. 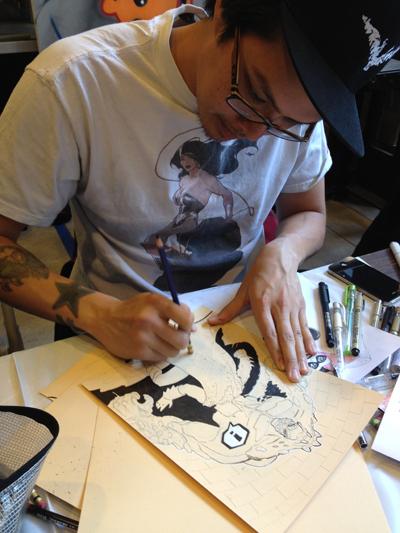 Well recently, Copic asked him to do a sketch card Tutorial showcasing his methods and use of Copic markers. You can view the whole Tutorial HERE on the Copic Blog Site. 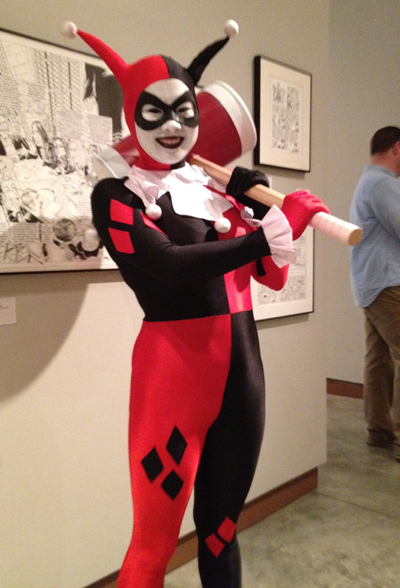 in the Cartoon Art Museum's Lobby and Admission was FREE. 2. A Raffle Ticket for our Hourly Prize Raffle! 3. Watch loads of Live Drawing by local artists! 4. 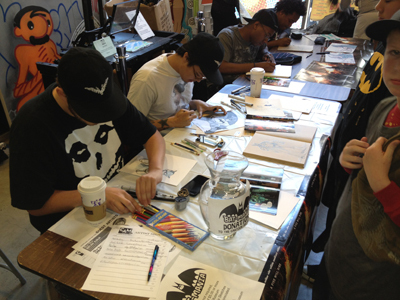 Sketch-A-Thon North Have an artist do a custom sketch for you (in exchange for a donation to the Museum). 5. 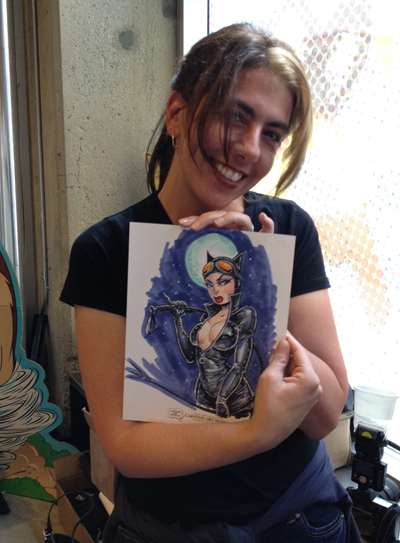 Super Deals at the ‘Super-Compact Pop-Up Boutique’, Loads of Original Art, Prints, Comics and more! 6. Hourly Art related Demos! By Artist like: Brian Kolm (Snownan the Brave), Chloe Dalquist (Jamie the Trickster), Chuck Whelon (Pewfell), character designer and Illustrator Karen Krajenbrink, Michael Capozzola (“Surveillance Caricatures”), and George Webber (Pirate Fairies, Tiki Tales). 7. A 15% discount at the Cartoon Art Museum Bookstore to anyone in Costume and to Artist who bring in their Portfolio/Sketchbook! Woo, That was a lot of stuff for $ 7.00 bucks! 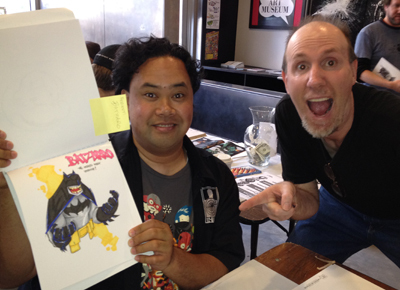 Vincent Kukua & Brian Kolm are wild for Batzarro ! And this was when it was slow! 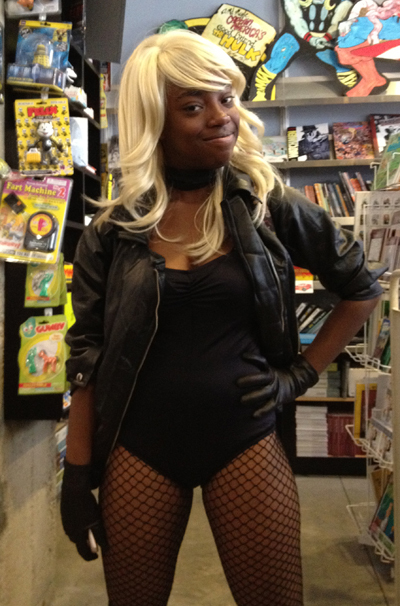 Another fan in costume ! 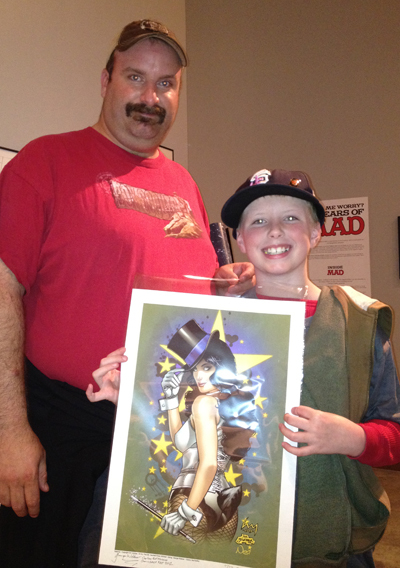 These guys got one of my Zatanna Prints as a Raffle Prize .. SCORE! 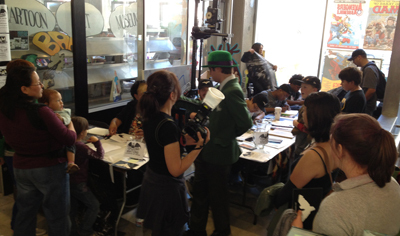 Check out this Oh so FUN Stop Motion Animation created by the kids in Brian Kolm's cartooning Boot Camp at the Cartoon Art Museum San Francisco ! CLICK HERE to view on Vimeo! Brian and I made the Egg Characters from plasitic Easter Eggs, Pipe Cleaners and Knead Erasers for the feet. If you have kids interested in Cartooning or Stop Motion Animation, contact Brian Kolm about the Cartooning Boot Camp Classes. Bizarro's 10,000th Anniversary Show" with Dan Piraro After 25 years at the drafting table, acclaimed cartoonist Dan Piraro, creator of Bizarro, has just drawn his 10,000th cartoon and is going on tour. Bizarro appears daily in several hundred newspapers across North American and internationally, and has won an unprecedented three consecutive "Best Cartoon Panel of the Year" awards from the National Cartoonists Society. For the years 2002 through 2008, Piraro was nominated for its highest award, "Outstanding Cartoonist of the Year," and received it for the year 2009. Our good friend Michael Capozzola is on the bill too, as well as producing the tour, handling PR- and spamming everyone he knows. It's bound to be a great show! The idea for Octobers "Comic Makeover" inkDrinkDraw seemed like a simple one, but some file errors nearly got the better of us. Fortunatly we had several stories so it worked out fine in the end. Find an old comic book (look online too) with a short story with 2 to 4 characters (two main characters and X number of side characters works great) that's about 3 or 4 pages long. The tackier the story the better, Romance Stories work great for this. Next convert all the art EXCEPT the boarders, word balloons and text to blue line art (see example below). 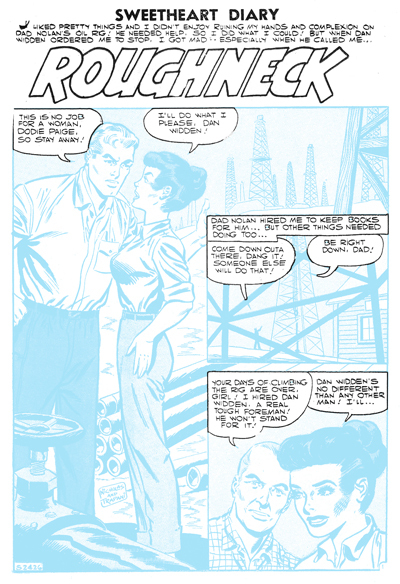 Once you have your Blueline sheets, print a bunch of those out keeping the blue fairly light (lighter than this sample), Two or three artist can work on a single story or if there is time everyone can do a full story on their own. Don't tell anyone what the story is or what it's about! Just tell them they need to design some characters (character's theme can be anything, cats, robots, monsters, whatever) as long as they are simple enough to do a four page story in the time you have. If you have lots of artist, one person can design the characters, one can do the pencils and one can do the final inking so it's a fun colaboration. Now that they have characters it's time to give them the story sheets and let them workout how thier characters are going to play out within the layouts of the blueline sheets (backgrounds can be altered to fit in with characters better if you want). Below is and example of how Brian, Jeff and I came up with some characters for the story above and then shared pencil and inking duties, Enjoy! Some of you maybe fimilar with with the Vinyl Toy Culture, or even making Paper Toys. It's an idea Brian and I have kicked around for a while as we both enjoy a good toy and thought this would be a ton of fun. So, September's inkDrinkDraw was at the Cartoon Art Museum in San Francisco where a group of us got together with markers, tape, glue and paper and made some really fun Custom Paper Toy Monsters. Boy this was a fun project to do as a group! I'd recommend this to any art group that wants something fun to do. Brian had put together several blank Template Toys for us to choose from and shortly after X-acto knives and markers were flying. 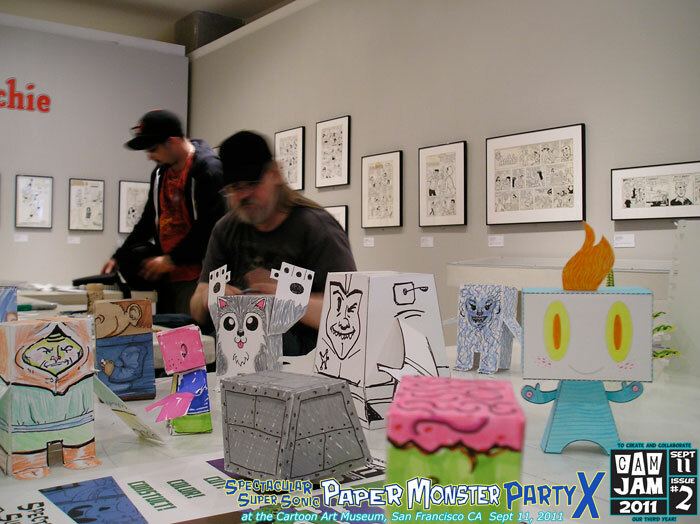 With a group of twenty or so artist going wild it wasn't long before we had a slew of assorted Paper monsters on display! 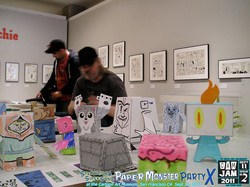 Or, you can still see the Paper Monsters at the Cartoon Art Museum Book Store, just ask Heather! Hope to see everyone at our next inkDrinkDraw party! I had to take the picture so I'm not in it, duh. 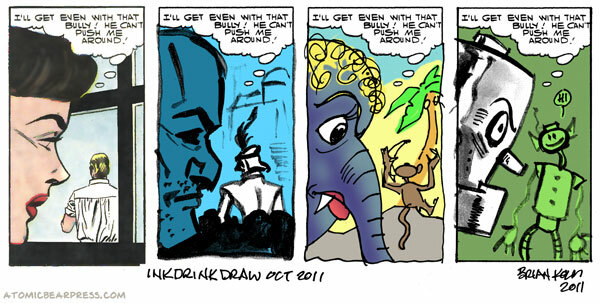 So last night's InkDrinkDraw at Church St Cafe (260 Church St - between 15th St & Market St) went really well. A lot of our regular group where out of town, but a few people we hadn't seen in a while came and it was a nice mellow evening of conversation and drawing challenges. The night's theme was "Working with Faces' and we came up with some interesting ways to challenge each other to draw faces in ways we might not draw them otherwise. We each drew a sheet of some fairly random shapes and handed them off to the next person to start making a faces from one of the shapes, the sheets kept getting passed around till all the shapes had become faces. We ended up with some pretty interesting characters! Next we each selected a character that we didn't draw and then created 25 "Expressions" of the character based on some "Experssions" sheets we had. It'll all sounds simple, but if you try it'll you'll learn a ton about characterization. Here's a complete example of a shape drawn by one person made into a character by Jeff Plotkin and the Brian Kolm drew the character in his style in 25 expressions > VIEW HERE. I'll post a few more images from the evening as I get them and have time. While we only had a small group for the very FIRST inkDrinkDraw gathering everyone had a good time. The meet was at HOOTERS SF near pier 39 so there was food drinks and the Hooters girls made for built-in models. We started off with George (Webber) doing a live Demo on using Copic Markers and talked about the advantages of Copics over many other brands of Markers. After that we did an assortment of Hooters related Open Projects, Brian work on quick Gesture sketchs of the fast moving Hooters girls, George was doing cartoon characters of the girls and Mike & Jeff did an assortment of cartoons and sketches. All in all a pretty good night andthe Hooters girls made out like bandits. A informal group of like minded artist in San Francisco hangin' out Inking, Drinking and Drawing stuff.